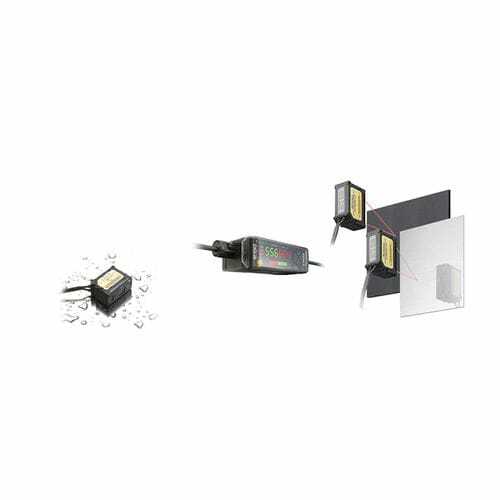 The Keyence high performance GV Series Digital CMOS laser sensor is the world's first Digital CMOS laser sensor to utilize Datum Algorithm. Using the Datum Algorithm, the GV series can easily detect metals with reflective surfaces and even black rubber targets; ensuring productivity and stability. The GV series is an ideal solution for various demanding industry applications. The GV series is crafted using the highest quality materials and the most modern manufacturing techniques. The sensor has a tough and rugged enclosure with an IP-67 rating. The GV series also features an extended sensing range of up to 1m or 39.37".